OPEN JUMP allows the use of our open trampoline area, dodgeball court, airbag and slam dunk zone. 60 min sessions start every half hour between our published times. PARENTS WITH TODDLERS - OFF PEAK: ONE FREE PARENT per transaction. Toddlers must be over 18 mth but under 5 yrs and accompanied by an adult - one adult can accompany up to two toddlers. Add TOTAL number of participants to your cart (toddlers PLUS free parent PLUS an additional paying parents). Apply coupon code P&T-5 before checkout for your parent-for-free discount. 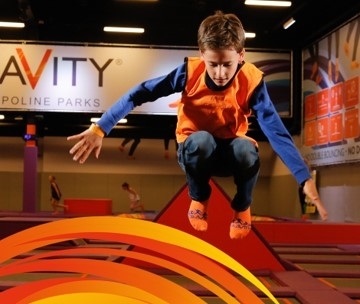 Online prices for OpenJump now 15% lower than walk-in - buy now to save £2.02 per ticket.